The Shanghai Volkswagen Lavida. VW will launch production of the Lavida EV this summer. SHANGHAI -- Volkswagen AG showcased three electric cars and a hybrid at a week-long workshop in Shanghai – offering a glimpse of its strategy to introduce EVs to the world's largest car market. The automaker displayed a Volkswagen Lavida compact EV sedan, plus an electric Golf and Up minicar. The Lavida is powered by a lithium-ion battery pack that can propel the vehicle up to 150 kilometers (about 93 miles) on a charge. 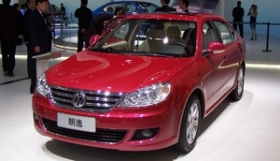 VW will launch production of the Lavida EV this summer, while the Golf EV will go into production in 2013, the Xinhua news agency reported. Volkswagen also displayed its gasoline-electric hybrid version of the Touareg SUV, which debuted at the Geneva auto show last March. Last week, China's central government announced plans to subsidize sales of EVs and plug-in hybrids with incentives ranging up to 60,000 yuan ($8,784). The subsidies are available in Shanghai, Changchun, Shenzhen, Hangzhou and Hefei.